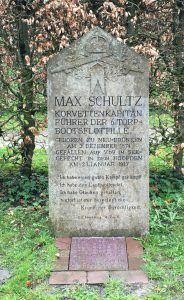 The tombstone of Max Schultz’s grave in the Wilhelmshaven Friedhof. Max Schultz was the VI Torpedo Boat Flotilla commander at Jutland and led SMS V.41 into attack Jellicoe’s Grand fleet battle line forcing the British Turn Away. Schultz and Jellicoe had know each other in China during the Boxer Rising. When the German had run out of food he asked Jellicoe, Seymour’s Chief of Staff. Jellicoe obliged and the two shared an egg and started a longer friendship. It was a cold and wet morning when we visited. Appropriate as it was not unlike North Sea weather. The Friedhof is somewhere I always go to pay my respects when in Wilhelmshaven at the Naval Museum. It is beautifully and lovingly tended and landscaped. But it’s also a deeply moving and very sad place to reflect a while with the German fallen. There was little glory for the dead of either side. Nick, this is a short but truly eloquent post. I’ve never been but it feels somewhere I should go. Dowdy you are not! Fantabulous 20p buy and you look great in it. Good luck with your sewing machine although you seem to have got to grips with it already. I don't have a good rehsniotalip with mine, its circa 1970 and every time I put it to use it results in much effing and blinding. Tikker, sinu puhul ilmselt ei olegi vahet, sest sa oled nii Ã¶ko, et kasutad marlimÃ¤hkmeid (st ma ei tea, kas kasutad, Ã¼ldistan praegu tÃ¤iega selle pÃµhjal, et enamasti Ã¶koemmed kasutavad), ja Dakil ka ei ole vahet, sest tal on tÃ¼tar, aga poisslaste puhul ju rÃ¤Ã¤gitakse pÃ¤ris palju kilemÃ¤hkmete ohtudest – munandite point ju selles ongi, et saab temperatuuri madalamana hoida, aga kui neid paar aastat (vÃµi ameeriklaste puhul ka 3-4 aastat) hautatakse, ei ole see sugugi hea.